The intersection of Myrtle Avenue and Post Road East. WESTPORT — Changes are in the works to increase pedestrian safety downtown, but concerns remain. Keenan, speaking at Wednesday’s Board of Selectmen meeting, said she has never seen traffic and safety issues like she has the past six months along Myrtle Avenue. Public Works Director Steve Edwards said there are plans to widen the sidewalks on Myrtle Avenue by Avery Place to improve safety. Residents and board members spoke at length of overwhelming traffic delays and safety issues along Myrtle Avenue. Staff Cpl. Al D’Amura, a police department public safety officer, said he and other officers have noticed Myrtle Avenue has seen a dramatic and unprecedented increase in traffic flow, a problem he attributes to a variety of factors, including the Bedford Square construction. 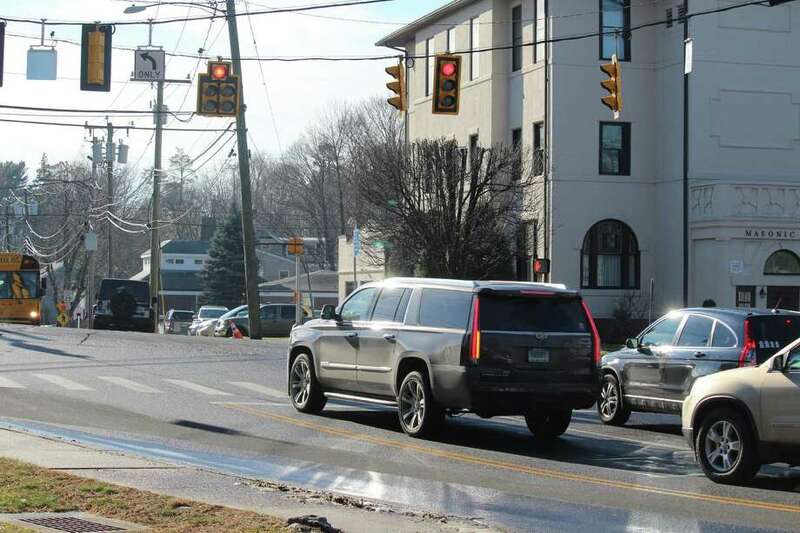 Last year, in accordance with law, the state changed the lighting cycle at the Myrtle Avenue and Post Road East intersection to provide pedestrians with more time to cross. D’Amura said the left-hand turn lane from Myrtle Avenue onto Post Road East is very short and only allows a small number of cars to execute the turn. He said traffic is “pinched” at that intersection and proposed lobbying the state to reconsider extending the allotted time at the light for people to make a left-hand turn. Police Chief Foti Koskinas cautioned the board any time added to the left-hand turn signal will add queues on Post Road East. Jennifer Johnson, a member of the Representative Town Meeting, said she witnessed a frightening scene at a downtown intersection. “I’ve witnessed two almost-fatal accidents at the corner of Evergreen(Avenue) and Myrtle (Avenue) as I was waiting to turn left to go up Evergreen coming from Town Hall. I was stopped to let a father and a daughter walk in front of my car, and unfortunately, the car came around the bend behind me, seeing that I was stopped, and swung around me, nearly taking out (the pedestrians),” Johnson said. D’Amura said police will continue to examine the issue and monitor traffic patterns, and the selectmen expect to discuss the issue again.